How cute and whimsical is this semi-homemade Snowman Cake! This is another great Christmas Cake to make with your kiddos! 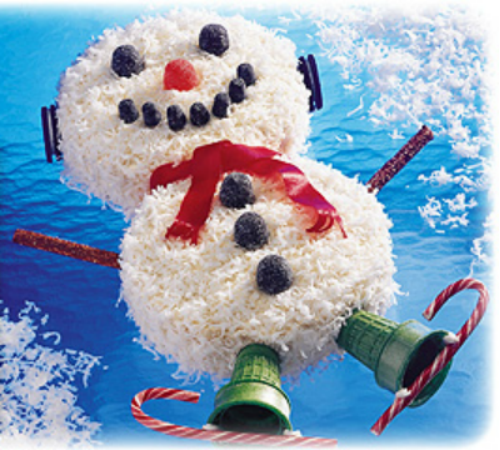 They will have so much fun helping you apply the coconut and assorted decorations. Use equal amounts melted, unsalted butter in place of the vegetable oil. The butter gives the cake a much richer, bakery like taste. Use equal amounts whole milk in place of the water. This also improves the flavor, as well as the texture of the cake. For those of you who like cakes made with buttermilk, use buttermilk powder reconstituted with water as per the instructions in equal amounts as called for in the cake mix. I personally love this stuff and use it frequently since it doesn’t require refrigeration. I don’t know about you, but when I use fresh buttermilk I usually end up throwing some away and I so hate waste! If you have never used buttermilk powder I urge you to give it a try. It is readily available in the baking isle of well-stocked grocery stores. Add 1 extra egg to the mix. This makes for an even richer, fluffier cake. Add 1 tsp vanilla extract. This also greatly improves the flavor and takes away that “cake mix” taste. If you are using a chocolate mix, add 1 tbsp instant coffee granules to the whole milk and warm it in the microwave for 30 seconds. This really livens up the chocolate flavor of the cake. You will find that if you use the above substitutions you will end up with a cake that no one will ever suspect was made from a cake mix. I promise your secret is safe with me (unless you tell them, of course 😉 )! Semi-homemade should never mean you have to sacrifice flavor, not in my world at least. And while I generally tend to make things from all natural ingredients, there are those times when I certainly fall back on a semi-homemade recipe. They are true time-savers, particularly during the busy holiday season. I would love to hear your thoughts on using semi-homemade recipes… do ya’ll love ’em or do you hate ’em? Be sure to let me know. Until next time ya’ll, have a great day filled with great food and lots of love and be sure to stop back by for tomorrow’s new 12 Days of Christmas Cake and Cheesecake post. I promise it will be another mouthwatering holiday goody! Today I thought I would share with you a Christmas cake that is festive, whimsical, and great fun to do with the little ones! Oh, and did I mention easy? With just 4 ingredients, it doesn’t get much easier than this! 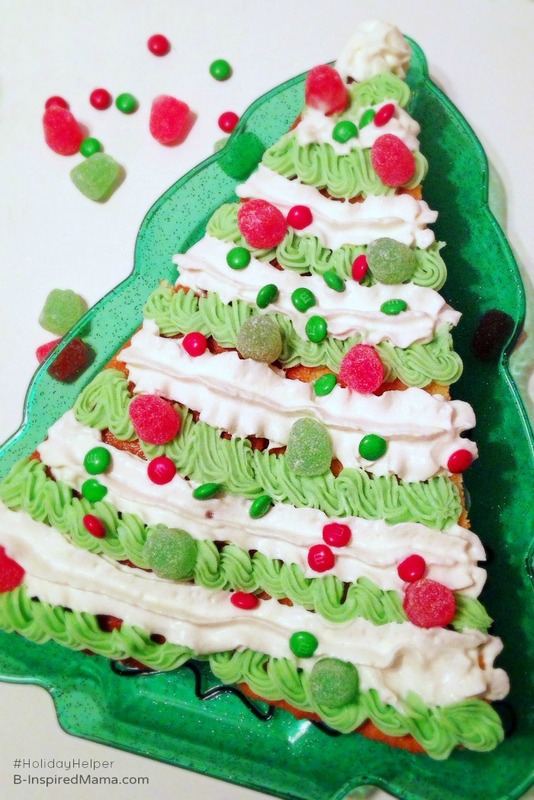 All you need is pound cake, whipped cream, decorator icing, candies… and your kids! So grab the kiddos, head to the store (kids are optional for this 🙂 ), and click here to have some Christmas fun! Taking time out from your busy holiday schedule and spending some time with your children and other loved ones can bring the true meaning of Christmas back into perspective. The magic of Christmas exists not in the material gifts we give and receive, nor in the hustle and bustle of attending festivities, baking goodies, and decorating our homes. The true meaning of Christmas resides within us, not around us. The generosity and warmth of spirit that becomes so palpable during the holiday season is a radiation emanating deep within our collective souls. This should tell us how powerful we can become when we unite together and focus on the truly important things in life and provide us with the desire to carry these feelings all throughout the year, not just during the Christmas season! Here’s a beautiful Christmas Song by Enya, “The Spirit of Christmas Past”, for you to listen to and reflect on the beauty of Christmas! Since I let you off easy today and gave you a semi-homemade cake to share with your family, tomorrow’s post will be a bit more challenging for all you daring baker types out there! For your hints, think of a famous French Christmas cake and chocolate!